Very hands on! Come ready to wear an apron, turn a crank on an antique stuffer or hold a sausage casing. Designed for home sausage makers! From those of you who have never ground meat in your life to those who are sausage maker extraordinaires but want to learn more. Many of you only make sausage once or twice a year and if it did not turn out right, it's months before you get to try it again and then you can only change one thing at a time or you don't know what you changed that you liked. 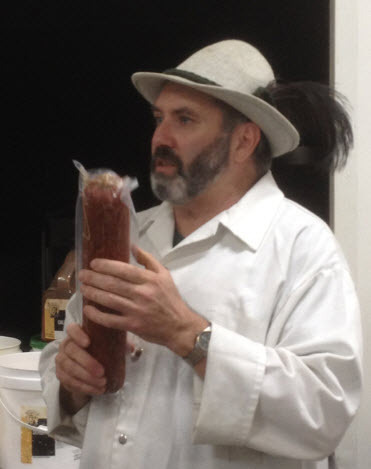 This class will cut your mistakes by years, using Wurstmeister Mike’s everyday sausage making experience. Informative! Each class includes a discussion of ingredients and a time to taste in order to understand the value of using flavorful ingredients and using traditional methods. A comfortable place to learn! You'll get one-on-one instruction and all of your questions answered. Guaranteed to fill your belly! Not only will you be served a wurst meal, but also treated to a wurst, wine and beer tasting, a Wurst Haus goody bag, 2 free drink tickets and you take home 2-3 pounds of sausage that you create in the class. Deals! Participants receive 10% discount on in store purchases that day. Cost - $79 per person, call 573-486-2266 to reserve your spot or register online here. 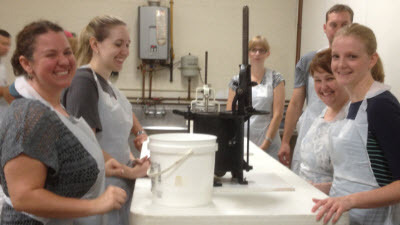 Wurst Haus classes are a great gift idea for birthdays, anniversaries, and holidays! Order class gift certificates here. January 12 -- Saturday 10 am & 2 pm Register Now! 10 am Class Cancelled due to snow forecast! January 26 -- Saturday 10 am & 2 pm Register Now! February 9 -- Saturday 10 am & 2 pm Register Now! 10 am Class Sold Out!